Because no one's required to pass a test before they can start a blog, anyone can have a blog. But a brand doesn't want just anyone to help spread the word about their products. They want someone trustworthy and someone who meets the specs of their target audience. Be consistent in your blogging; you don't have to blog every day, but you should stick to some type of loose schedule. Show that you're willing and that you'll constantly deliver so that brands know what to expect when they contact you. If you blog sporadically and your content is hit or miss, you might be less likely to be approached by brands. 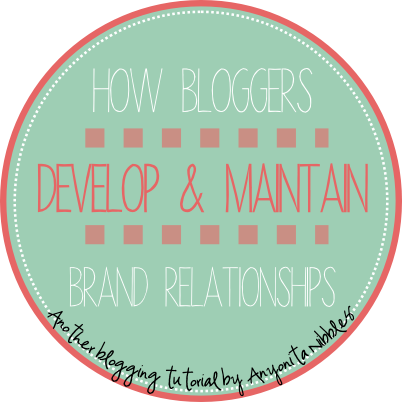 You don't have to always blog about one thing (look at Anyonita Nibbles; it's primarily a food blog, but on Thursdays, I blog about blogging tips) but you should make sure that you stay relevant to your niche. If you're a food blogger then 90% of your content should be about food. Ninety percent of your ads should be related to food (when applicable). Consider how confusing it would be if you came to my blog and only found one food related post a week. Stay relevant. Speaking of relevance, I'm in a competition to win a trip to cook in Paris & I need your vote! Please could you take two seconds to go vote for me? I'd really appreciate it! Brands are authority figures on the products they produce. If you wanted statistical information about the number of burgers consumed in your country, who would you go to: McDonald's or the car manufacturers BMW? When looking for bloggers to work with, brands want to be sure they're looking at an authority on a given topic. You may not know everything about your blogging niche, but you'll know enough. Brands rely on blogs to gain access to potential audiences they may have been unable to reach. That in itself gives you an edge and makes you an authority in your niche. If you're getting the pageviews that attracts brands to your blog, you already know how to reach your readers; be confident in your ability to reach them. Be aware of the content you write and your position in search results as both of these help to determine your authority on a particular subject. The people behind a brand's PR team are just like any other reader. They'll resonate with someone who is consistent, warm and open. Think about your favorite blogs. Why do you read them? Most times, it's because you are able to gleam a true sense of the blogger(s) behind the blog. You know things about them; you understand them. You read their words and it's like you can hear them speaking to you. They have made themselves or a version of themselves known, accessible and relate-able. Those are qualities that everyone looks for in bloggers, whether they're general readers or PRs. And for the bloggers who choose to remain anonymous: you can still achieve that consistency, openness and warmth. Just find a voice and stay true to it. It doesn't matter if you're blogging behind a persona or using your actual name: consistency and relate-ability are key. ++ Be sure that you state on your media kit or your media page that you are welcome to being contacted by brands and companies. ++ Be sure that you mention on your social media tat you are welcome to being contacted by brands and companies. ++ Be sure to showcase any previous work you've done with companies as this is the best form of marketing and clearly shows what you're capable of and what companies can expect from you. Great post with lots of good info Anyonita! I voted for you to cook in Paris and you're right, it only took a couple of seconds. Hope you win!!! I love your blogging posts! They're so informational! This is excellent - thanks for sharing. Pinned.